Bukit Tambun is a fishing village located on the mainland in Batu Kawan, under the Penang state. I will blog about the place and its seafood later. One of the attraction from Bukit Tambun is their sweet jelly. These jellies are eye candies. They come in so many shapes, colours and flavours. The above photo is the range of available jellies. 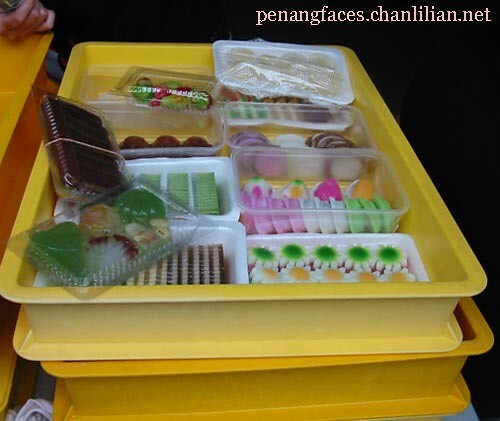 Three boxes of these jellies cost RM10. The jelly is made from the agar-agar powder and also konyaku jelly. You can see the santan and pandan layers jelly, tiny ones with one longan in each piece, coconuts flavoured made from coconut water and coconut flesh and of course, the jelly angkoo. This photo is not very clear because my sons were grabbing the jellies before I can manage any nice close-up shots. Anyway, I hope you can see the miniature, pink, green and white angkoo. These jelly angkoos have fillings like peanuts, corn, red-beans and lotus paste. 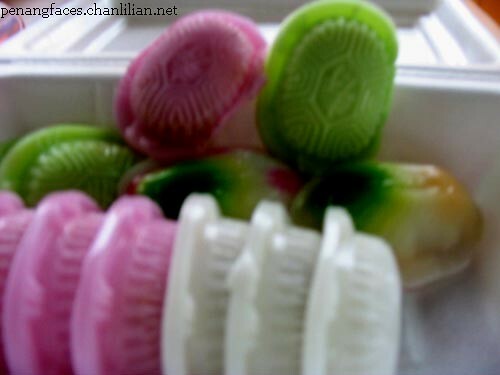 Though other places tried making these jellies, I found that those from Bukit Tambun still stand out in terms of workmanship. It must be a tedious process making them because several process are needed in order to make the layers. 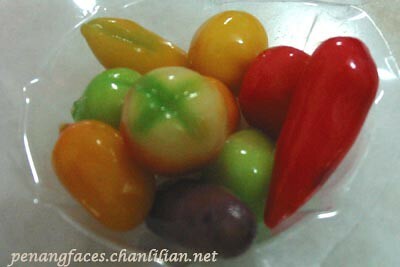 While on the subject of jelly, I also have one photo of miniature vegetables made from konyaku jelly. I bought this from one of the night market in Penang. Can you see the brinjal, tomato, chilli, lettuce and etc? **Bukit Tambun is easily accessible from the North-South Highway exit at Bukit Tambun. Just drive straight to the end of the road where the jetty for ferry to Pulau Aman is. The uncle who sells the jelly put his tiny stall at Gee Seng Seafood Restaurant. They don’t make cendol like the old days, do they?